The Redskins are hot in DC this week. Just about everyone who doesn’t already have a team allegiance is on the bandwagon now that they have won their first playoff game, and face the NFC’s #1 ranked team on Saturday. I’ve loved the Redskins since I was a kid, even waking up at 7am on mondays to watch games when I was in Sydney — but now I’ve got a reason to appreciate them on a communications level too. The NY Times covered a story last week about how the Redskins handled the contract extension announcement for their popular assistant head coach, Gregg Williams (widely considered a candidate for many other Head Coaching jobs). 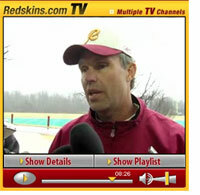 Snubbing the traditional media, including the Washington Post – they publicized a video conference only on Redskins.com and followed up with an interview granted to George Michael, a longtime friend of the coach and team, and sports anchor for the local NBC-affiliate. Of course, the "wronged" traditional media cried foul … enough to even get the story into the NY times. But the case raises an interesting question. With the explosive growth of exclusive content on Redskins.com (and many other team’s pushing their own sites), why should teams work with traditional media at all? I have often questioned why coaches would grant interviews at halftime or after a tough loss. What if they didn’t have to deal with the media in these tough moments? What if, unlike any other industry, sports teams could give traditional media (and any associated biases they bring) the collective finger and just report their own news to their own fans. It’s a dangerous model if we’re talking about any other kind of news – but for sports teams, are people ever seeking truly objective reporting (unless they are Cowboys fans)? I admit to my own biases here – but sometimes the best way to "watch" a Redskins game is to turn the radio to 106.7 and listen to Sonny Jurgenson and Sam Huff announce it. I just love listening to them groan at an interception or happily celebrate a long touchdown pass. Sometimes, perhaps it’s better for local media to proudly wear their bias on their front sleeves and be a part of their own community. Especially when I agree with them.